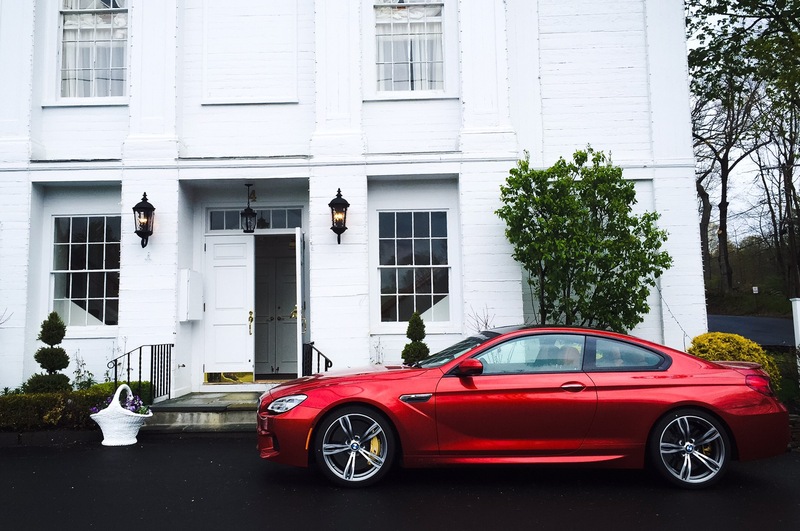 I needed to arrive in style for the opening of the Porsche-BMW exhibit at the Larz Anderson Auto Museum. Luckily, we just got this new BMW F13 M6 as a demo car so I borrowed it for the night. It’s a 2016 in Sakhir Orange with matching extended Sakhir leather. It also has the carbon brakes option. Our race team campaigns two M6 GT3 cars in the IMSA GTD class. There is a lot of similarities between the race and production car, especially in the engines. I’ve driven a few of these cars before but they’re almost always modified. This was my first extended drive in a stock car. Every time, I am overwhelmed by the gadgetry inside. This was a rainy evening so I needed to find a wiper setting, turn on the front and rear defrosters, plug my phone in, adjust the mirrors, find a good seating position, and set a decent radio station. I was under way in less than four minutes. The seating position puts you very low, which is exaggerated by the high belt line. I could only guess at the approximate location of the corners. The overhangs are generous but most of the weight is within the wheelbase. Check out the front seat location in the photo above. Somehow, the M6 manages to feel almost nimble. Our race drivers say the same thing – great balance and the car is very easy to drive. This was a blessing and a curse as I wound my way down Route 1, Storrow Drive, and the Jamaicaway before arriving at Larz Anderson. Boylston Street was especially nerve wracking with that giant beak leading the way. I once drove a McLaren F1 down the same route and this was worse. The 6 series can’t really be any smaller though, or it would be a 4 series. Power was as expected from an M-tuned 4.4L twin turbo V8, once you got past the lag in the first quarter-inch of pedal travel. I never went full throttle because of all of the thrust available. I’ll be driving an M5 soon with proper ECU tuning and it will be interesting to see how much better the throttle mapping is. Another complaint is the sound, or lack thereof. Twin turbo cars are not known for volume anyway. But even with the engine sounds funneled through the stereo speakers it’s still inadequate. If I owned this car I would have to install the Turner muffler delete pipes, or something similar. This car is just too much – bodywork, gadgets, power, luxury. It would make a great cruise missile with first class accommodations. Or if there were autonomous features that took all the stress away from the parking and close quarters maneuvering. Then I could devote all of my attention to learning the dash. I feel as though this is the zenith of BMW performance, technology, and driving dynamics. I can’t imagine needing anything more than what this car provides, except all of this in a smaller and lighter package (like what you get in a 435i M Sport). Maybe I just appreciate what I have and don’t need additional complications – this is an E21 blog, after all – but I think BMWs stopped being the Ultimate Driving Machine after the E46 M3, with a few low volume exceptions.